I’m looking for a guest reviewer please to trial and review a range of skincare products for blemish-prone skin. The reviewer will receive a The Doctor Brand Blemish Relief Kit (£19.95) which includes a 3-step programme to help clear skin. If you’re up for the challenge, please register your interest below and remember to put your email address in the bit where it asks for it so that I can contact you! I’d like you to give the range a minimum 3 week test period before letting us know your thoughts…. so if you can commit to a new skincare routine for that period and are happy to share your thoughts with my readers then let me know in the comments below! I’ll chose a reviewer on Tuesday 15th March. 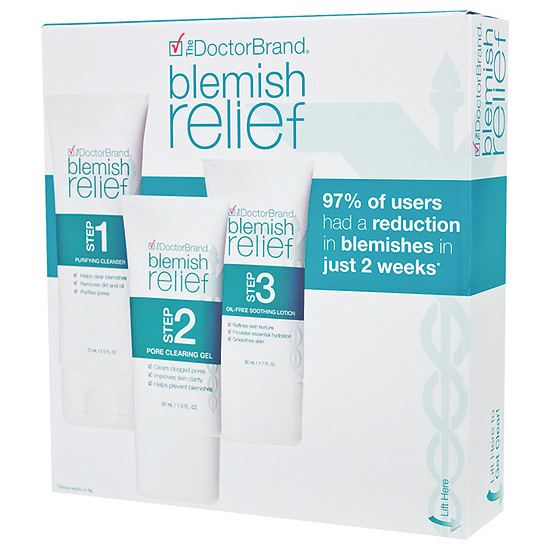 I would love to review The Doctor Brand Blemish Relief Kit for you. I seem to get more spots now than when I was a teenager and my chin and jawline especially is full of blemishes. I keep trying different skincare routines and haven’t found one that helps yet so I would be really interested to try this. I am definitely up for trying this out! i would soo love to try this, i have learnt how to keep my skin clear, but blemishes from previous skin havoc is there. I’ve tried everything, so i would be up for the challenge. I’d love to trial this! My skin is going through a right mare at the moment, it’s worse than it ever was when I was a teenager. Boo!! I would be up for trying this! Hi, would really love to trial these products as I have oily, acne prone skin and am always trying to find my HG moisturisers, cleansers etc… Have tried loads of brands (Dermalogica, Vichy, Eucerin etc) but am still looking for my holy grail. Using La Roche Posay at the moment and it seems to be good – clearing up my skin But I would love to try this kit too as, who knows, this might be even better! I would love to try this, my skin is going through a bad stage at the moment – I’m getting some of those big, under-the-skin, oh-so-painful lurkers and areas of rash like pimples on my forehead. So not attractive when I want to be wearing lighter make-up for summer! I would love to try this! I have oily skin and acne, so it would be interesting to see how these products work. And I’ve been thinking of starting a blog once my exams are over so I’d love to get some practice! I’d be interested in trying this (always willing to try something new, I’d kill for blemish free skin). I am 28, and I have acne-prone combination skin. I am virtually *never* entirely without spots (like maybe one week every few months, and even then I’ll still have fading red spots). I have a quite reliable monthly break-out as my skin gets worse in the week before my period, but this does not account for all of my spots. When I’m having a breakout I usually have at least 3 significant spots (not counting tiny ones) the rest of the time I usually have 1 or 2. Most of my spots are on my chin and jaw area, but I do have a little bit of spottiness on my forehead, and occasionally upper lip (ugh, I hate those). I’d love to try this out. I’ve used many different products in the past, including sets from The Body Shop, Clean and Clear and most recently Clinique. I’ve been using Clinique’s Anti-Blemish products for a while, and I’m running out, I was thinking of trying something else, mostly due to not being able to afford the Clinique at the moment though, so I would love to be able to give this a go. I have oily skin, and have suffered from acne for years. I’ve found products that keep it under control for a while, but always seem to breakout again after prolonged use, and haven’t really been able to completely rid my skin of the problem. But yeah, as I said, I’d love to give this a go, and hopefully find myself an amazing new 3-step system in the process. I’ve been struggling with really bad acne for 2,5 years now, after always having really good skin. I haven’t been able to find anything to help my problems other than a heavy duty concealer. So I’d definitely like to try out these products. Who knows, it might just be the answer! Would LOVE to try this. Cancer has made my skin so icky and blemish prone. I really suffer with oily skin! I’d love to try it out. I’m 18, so I feel like I should be past these skin problems by now (okay, so I’m a little impatient!) but in the last two or so years my skin has become really oily, and I have problems keeping my pores clear – no matter what I use, how little make-up I wear or how frequently I wash my face. I’ve used the cheapest of cheap products (boots and superdrug own brands etc) through to Karin Herzog and other more expensive – or expensive to a lowly student anyway! – products, yet nothing has worked. At the moment, I’d describe my main skin flaw as blocked pores around my nose and mouth, and tiny irritating spots around my chin and forehead. I do have a few patches of dry skin on my cheeks from living in the country, but an oily forehead and nose. By the looks of the products, I’d say they’d benefit my skin pretty well, so I’d love to give it a go! Hi i’ve been looking for something to sort out my spotty skin for ages now. I never suffered from acne when i was younger but recently i’ve been breaking out on the sides of my face and down my neck, it’s not too noticeable when i apply my base. Usually my skin is quite clear i only really get one spot ever so often and then it disappears but i’ve had these for a few months now. I’ve been using Elemis SOS cream but that doesn’t seem to work so i’m even thinking of going to doctors! I would really like to try this out and see if it helps. I would love to put my name down to trial this. I have such blemish prone skin and I am always looking for new ways to help it out a little. This could be it! I’d love to try it out and give you a report! I’m 23 years old, and I don’t think I can remember a time since before I was 14 where I haven’t had at least a pimple or two on my skin ruining my day. I get it all – blackheads, little whiteheads, and the big, cyst-like ones that hurt like the devil. I find it a little funny that I’m at an age where I’m using anti-aging cream on my eyes, and teenage directed pimple cream on the rest of my face. I’ve been on the search for something to target my hormonal acne since they started popping up about 9 months ago and have been through almost everything imaginable- from anti biotics, proactive, differin, you name it I’ve pretty much tired it. I would really love to let you know what I thought of this I’m only 16 and I still get quite a few spots (some quite bad ) and haven’t found anything that stops them completely yet. I only use Cetaphil cleanser and moisturiser and my Clarisonic at night to remove my makeup so I would really love the chance to try these new products and let you know if they work well! Hi, I would love to give this a go! I’m right at the age of hormones raging, so something to remedy that would be great! Anyways, thanks for the offer, good luck everyone! I’ve heard of this but haven’t tried it before, so would love the chance! I’m 20 (almost 21…boo) and have regular breakouts depending on my stress level, general health and diet. Whoever said being a student was easy, all fun and drinking? Anyway, I really hope I’ll get a chance to try this and I would love to write a guest review, especially since I’ve just started blogging and would like the opportunity for some exposure (in a non-flasher type way). Feel free to check out my blog for a sample of my writing! Hi, i’d be up for this trial. Usually I have relatively clear skin but recently after a hormonal breakout I can’t seem to get rid of those that have appeared, Im just coming to the end of my special clearing gel by Dermalogica so would be a prime time to try something different too. I know I’ve trailed for you before but I’d love to trail this kit. Now that it’s getting warmer my what I thought was tamed skin is getting worse. My spots are coming back on my chin and cheeks and once again I’ve tried everything and whilst they work for a while, they soon become immune to my skin and therefore stop working. It’s a pain constantly changing my routine and for once I’d like to try something that will stick with me for a long time. My hormonal acne is killing me! Id love to try this. I’d love to review this! My skin is awful at the minute and I’m desperate to find something which will cure my enormous under the skin spots which seem to be totally relentless. I’ve tried pretty much everything I can get my hands on and it’s all useless, so I would really love to try this out. I would love to put a request in for my daughter – she has typical teenage skin and does get quite a lot of spots, some large some small, but always there. If that would work for her it would be great as the only answer the GP has it to put her on antibiotics, which I am not keen on. She has dry skin as well, so a moisturizing oil sounds perfect. Most of the other acne treatments on the market dry her skin even more and leave it flaky and horrible looking. I would love to try this out! As someone in their 20s who is still battling acne, I have tried almost everything and still have not found the one routine that works for me sadly. I get spots so often and some things tame them but I am yet to find something that clears them all away!! Oooh yes please, considering my skin is atrocious. OMG – this is too crazy…I have just spent the morning doing research trying to find a new skincare regimen, and then I read my email and here you are!!!! Crazy, huh? I am soooo in the market for new skincare, and I would absolutely love to try these products and review them for you! I am more than happy to give it the time it needs to determine how it works and would love to provide your readers with true, honest feedback! I’m home dealing with a disability, so I’ve got nothing but time to do whatever is necessary to help gals outt here try to find hwat just my be holy grail skincare!!! Love the idea! Hope you pick me! Would be so happy to review these products, i have suffered from acne in my teens and finally have it under control but my oily and blemish prone skin still causes me daily nightmares! I use dermalogica products daily and microdermabrasion exfoiliators twice a week but I am always on the look out for other products to help me!! P.S. I don’t live in the UK, is that ok? Hi! I’d love to test the skincare kit. i’ve recently started to break out after starting bikram yoga sessions because my body has been detoxing. Hopefully this new regime will help. Thanks! I would love to be your guest blogger. I have combination skin and am yet to find a way to keep it completely blemish free. I am a regular blogger but am slowly making the move over to a more fashion/beauty focused blog rather than my usual randomness and it would be great to get some practice in writing a focused beauty blog. I’m super excited about this product and have been looking into getting it! I have just had a huge over haul of all my products in a last ditch attempt to rid my self of bad skin! I love giving things a real good test and would love to do this kit! ..but seriously! If I could change one thing about my body it wouldn’t be my tiny post baby breasts, nor would it be my stretchmarks OR my thunder thighs – it would be my skin! It tears my confidence daily.